It's exactly a month before our Honeymoon/First-Year Anniversary/Vegas Wedding trip and I'm having mixed emotions about it...but overall I'm excited. For those of you who are new to the blog, hello I am Rebellious Bride Kai and I am getting married again, third time to do it, and I've only even been married for 11 months as of today. Rebellious Bride Mica calls me a wedding addict. Bow. How did this happen? Well, for starters, our Boracay Hop wedding, while we love it so much with such a passion, had a few minor "challenges". First challenge which we had to pacify during our Sunshine, Tea-Time, Hats and Pearls Round 2 wedding, was that my parents were simply not happy with our first wedding and don't even consider it as our wedding. So they wanted their own version of our wedding, in Manila so they can invite all their friends and so that they can have a version of our wedding in the Catholic church. Since we already had our dream wedding in Bora, we painfully obliged to go along with this request but with a few of our own conditions. The third wedding in Vegas is also addressing the other "challenge" which is 98% of my husband's closest of friends were not in attendance in our first wedding. Again, while our Bora wedding was a dream wedding and that my husband loves it dearly (he swears he watches our wedding video everyday...awww), the fact of the matter is, a part of him felt sad and incomplete knowing that his closest best friends couldn't make it. See, my husband grew up in the States and he hasn't seen his buddies for 11 years. So this Vegas wedding is really all about making the hubby happy. I call this upcoming wedding a "fraternity, all-boys wedding" because I am nervously anticipating what could be like a college boys type of get-together where the bride will probably feel awkward, "one-of-the-boys", and homesick. The theme however is all mine. 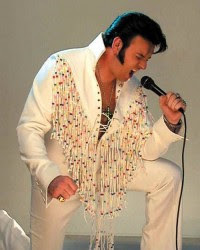 One of the things under my Bucket List of things is to get married, Vegas style, by "Elvis". So we got a $299 package called "Do Wop", in a small diner-themed, turquoise colored Viva Las Vegas chapel, serenaded to the tune of "Love Me Tender" by possibly a cheesy-looking impersonator, followed by just a simple celebration over a "The King"-themed cake and wine, and that's what I am most excited about. Originally the wedding was supposed to have been a full-on production of sorts. Jason Magbanua doing the video, Nelwin Uy as photog, Madge Lejano for makeup, Vatel for the bouquet and a glamorized Hindy Weber Tantoco creation in the hues of gold and navy blue. But due to some unforeseen circumstances, not all of these things will materialize. These things happen and this is how you become even more creative and resourceful. I'm planning my third wedding and yet I still experience some glitches. So if you are planning now, don't feel frustrated, don't feel like the world is about to end. Relax. Chill. Have fun.